“French Women Don’t Get Fat” is based on the principle that by adopting the diet and lifestyle patterns of French women it is possible to maintain a healthy figure while avoiding the experience of deprivation that is common with most diets. The author of the book, Mireille Guiliano, recommends eating for pleasure and to focus on the enjoyment of food. No foods are forbidden so long as the portions are kept small. She says that the biggest secret of French women is that they learn to eat with their heads and choose their indulgences wisely. She emphasizes quality over quantity, eating slowly, savoring the unique flavors of each food and to stop eating when satisfied. Guiliano shares many tricks that French women have been using for years to maintain a healthy figure. To kick start weight loss Guiliano shares a secret recipe of French women; “Magical Leek Soup”, which is to be the only food consumed over an entire weekend. A weekend of leek soup and lots of water acts as a diuretic to promote a rapid weight loss which has the effect of increasing motivation as well as acting to reset appetite. The weekend is used as a time for reflecting on your current diet. The first 3 months involve retraining your taste buds and adjusting your mental and emotional attitude toward food. During this time you will identify problem foods or imbalances in your diet based on what appear excessive in your judgment. You will remove offending foods from your diet wherever possible while deciding which foods you really don’t want to do without. It is all about choosing your indulgences wisely and exercising portion control. After 3 months you should have adapted to a new way of eating and thinking about food and lost at least half of your target amount. At this stage you can experiment with including a broader range of foods and more treats. Guiliano emphasizes the importance of eating three meals a day and always eating breakfast so as to keep the metabolism working at a steady rate. She also recommends preparing as much food at home as possible so that you have awareness and control about what foods you are consuming. Restaurant and takeaway meals are often very high in fat, salt and sugar and should be occasional treats rather than everyday fare. Guiliano highlights the value of fresh seasonal foods and encourages the use of vegetables and fruits in abundance and the use of fresh herbs and spices to add flavor without excess calories. The book includes many recipes that prove that it is possible to eat delicious food and still lose weight. Water is recommended as the beverage of choice. Wine is allowed and actually recommended but only with meals and with an additional glass of water. Bread and chocolate are foods to be embraced but with awareness of quality over quantity. As Guiliano says it is far more pleasurable to indulge in a piece of the finest chocolate than a dozen candy bars. Two serves of natural yogurt are suggested per day as a hunger reducing snack. Structured exercise is not required but instead readers are encouraged to take the opportunity to increase movement in daily life activities whenever possible. These exercises can be used with this diet. No deprivation. Can enjoy all your favorite indulgences without feeling guilty. Increases awareness of eating and portion control. Abundant intake of fruit and vegetables will provide many health benefits. Daily servings of yogurt will provide calcium as well as being associated with increased fat loss and muscle maintenance while dieting. May not appeal to those who like carefully constructed plans and counting calories. 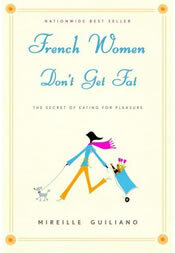 Not all French women are slim, so the title is a bit of a misnomer. If you’ve tried many diets and given up because of boredom or the feeling of deprivation, this approach may just be the answer for you. Guiliano gives practical advice that will help to make positive changes that can become a permanent lifestyle rather than a temporary diet. Guiliano, M. (2007). French women don’t get fat. Vintage Books. Kristin, one of her big tips in the book is to never get hungry, so I don’t know where you got the idea of her not liking snacks from. She does say not to eat on the run so maybe you got confused? I thought this book was fantastic. I didn’t feel like I was reading a diet manual, I felt like I was reading someone elses story. I found a lot of the information extremely helpful. If you read this book looking for a step by step meal plan and rules on how to exercise, you will be dissappointed. It will give you guidelines. Adjust the guidlines to fit your life and you’ll be happy. Personally, I follow the guidelines in this book, as well as calorie counting and working out at home. No matter how you diet, you need to set up a plan for the rest of your life. For me, this one works, enjoy your food, take time to eat, smaller portions. This way you are really training yourself to eat better and more wisely, fad diets just don’t work long-term and set you up for the up and down the scale syndrome. French women get fat. Just not as many of them as us. But I remember reading that the overweight issue affects 45% of French women. That’s not nearly as bad as in the U.S., where an extra 20% of women are overweight. But it’s still a lot. I know some fat French woman, but I know a HELL OF A LOT more fat Americans. Not all French woman are slim, but obesity is less of a problem in France. And yes, it’s common sense not to eat large portions, but you can eat high fat, delicious food in smaller amounts and lose weight and/or stay slim. The book is showing you a way to lose weight, be active and eat great food without depriving yourself. Not everyone loses weight eating great food, so whatever. Bottom line is that it’s a great book- I own it and it does have some good recipes. I didn’t eat everything out of the book or follow the plan to a tee, but I did get a different outlook on food and being active. Since then I’ve lost 86 lbs. 🙂 That plan doesn’t include “gouter” or what we call I snack. The author says you can add yogurt as a snack if you’d like, which is good so then you don’t starve in between meals. This diet is kind of stupid, its mostly common sense in the fact that you dont eat large food portions when you’re hungry, keep them at a good size and dont overeat during the day. Drink plenty of water. This is not uncommon. Thats not really something I would want to try. And anyway I know ALOT of fat French women. What is the recipe for the magical leek soup?